On July 6th I was beyond honoured to kick off the summer by leading the first Tribe park yoga class, as part of the summer long Yoga Jam. We had 28 participants show up to stretch and build strength in the glorious sun. Oakley Canada provided yoga mats to all participants, Degree Canada provided participants with antiperspirant to Do More. Music was playing, the sun was shining, and fun was had by all. 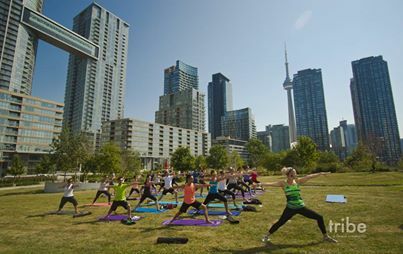 Free community yoga as part of Yoga Jam happens every Sunday morning from 10-11am at Canoe Landing Park, 95 Fort York Blvd. All levels and ages are invited to this weekly event. For further information check out the upcoming Tribe Fitness events here! Hope to see you on the mat!